At their high school orientation Whitney Montaine, Jake Rodriguez, Zoe Laybourne, Mia Flint, and Gregor Lombard had written letters to their future selves and promised to open them at graduation. The next four years changed their entire lives. During their freshmen year the teens were young and entered high school not knowing the journey ahead of them. Whitney had the life any girl would wish for. She had the perfect friends, a perfect family, and the fact that she was one of the most popular girls in school wasn’t so bad either until her whole life slowly started to fall apart. Gregor, a cello player, desperately seeks love in high school until an unfortunate tragedy changes his life forever. Zoe is forced to move to Hankinson New York because her celebrity mom is in rehab, again; yet there are still many other secrets about Zoe that she herself has yet to find out. When the honor student Mia enters Hankinson High School, she becomes confused because half of her is still in middle school.Everything was confusing for Jake. After he developed a crush on his best friend in middle school, people saw him differently and as a result he became a new person when he entered high school. Throught the four years the five teens change and all somehow come from being total opposites to friends. They all connect in different ways and through little details that the author remarkably adds. 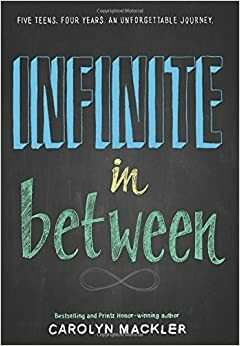 The author wrote each chapter in the perspectives of each teenager therefore it was interesting to see their different personalities and their outstanding connections. For example, Gregor’s dad had a crush on a girl in high school who happens to be the mother of Whitney, who Gregor likes. This coincidence shows how the characters in the story all connect to each other, without them knowing it. Carolyn Mackler wrote a fantastic novel that I honestly, could not put down. Every chapter had twists and turns that either connected the characters together or changed their lives. For example, one week Mia is completely invisible in the high school crowd but the next week, Mia becomes the most talked about girl in school. Most authors of young adult books don’t capture the real experience of being a teen they just write about the crazy emotions surrounding them and how they think teens act. Carolyn Mackler truly understood the characters and bestselling authors such as Gabrielle Zevin also agrees that Carolyn Mackler ¨doesn’t write teens as adults want them to be; she writes teens as they are.¨ The details, the plot, the twists, the tragedies and the harmonys all bring Infinite in Between to life. In 462 pages, Carolyn Mackler includes all the challenges and fun of being a teen and I enjoyed every single page.